Link building for SEO is the art of obtaining or negotiating backlinks for your website. It is, hands down, the most powerful and important aspect behind successful SEO campaign along with quality content creation. Well, for starters, Google openly admitted not long ago that “links pointing to your site” are a top three ranking factor in the SERPS, along with content quality and Google’s RankBrain. So, while it’s obvious that we need effective link building strategies if we want our websites to rank, first we need to understand what Google considers “good” backlinks to be, that way we can understand how to harvest them for ourselves. So, let’s start there. Will having tons, and tons of backlinks help us get to the #1 spot for our keywords? Well, not necessarily. Google, in an effort to provide the best experience to its customers (which is basically getting them the most relevant and useful results for their queries), introduced the PageRank algorithm (which tracked how many websites linked to a page) and the Google Penguin update that checks for how good those links are, by taking relevance and quality into account. Google PageRank? I though PageRank is dead? This is why your link building strategy should always target high-quality backlink opportunities that pass both PageRank and Google Penguin standards. This is the foundation of link building for SEO, and I’m going to show you exactly how to filter useless backlinks from good ones. We discussed in a previous article exactly how crucial it is to perform regular site audits, but it’s especially important to do so when you’re about to start your link building for SEO efforts. Imagine that you successfully create amazing content, and you leverage high-quality links negotiations like a pro, only to find out you have a bunch of redirects or 404 errors on your website. Or worse, you might get a snarky reply from an authority in your niche saying they can’t even access their website on their mobile device. Ouch. The fact is, part of having quality content (a top 2 ranking factor) goes hand in hand with making sure your content is actually readable and highly optimized around your keywords. So, before you start reaching out to the world, make sure your house is in order. Link building prospecting is simple (but also potentially time-consuming). You look for websites whose audience might be interested in your content or products and store them in a database for possible contact. 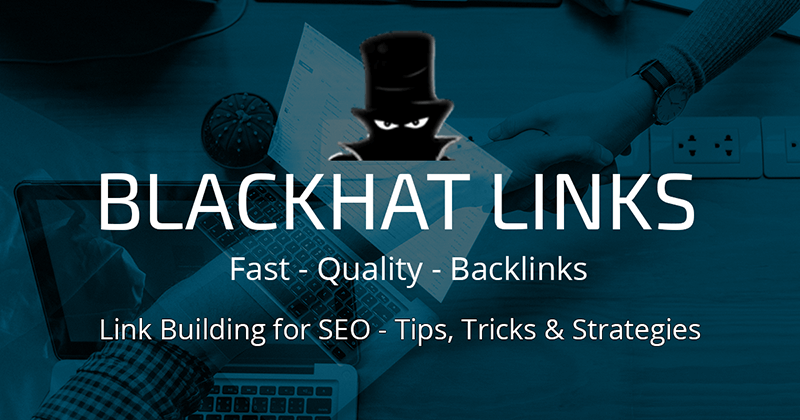 We talked about the best SEO chrome extensions, and we at blackhatlinks use many of them for link building prospecting. I suggest you take a look at them if you haven’t. Notice how this is effectively an exchange. When it comes to link building SEO, I notice a lot of marketers feel entitled to get links to their websites and get frustrated when they’re denied for whatever reason. Often, your outreach negotiations will lead to a dead end. You might not get all the links you initially hoped for, but sometimes one or two links can make a huge difference in the long run. We highly recommend you mix your usual backlink efforts with a healthy mix of PBNs and Social Media Signals. We also published an article on how to distinguish good PBNs from toxic ones, so be sure to check that out. The key takeaway? it’s critical that you hire expert PBN owners exclusively, else you risk your investments for no reason. We’ll talk about this later in this guide! Our first criteria involve Domain/Site authority. It’s a metric that determines how “strong” a site is. A respectable authority in an industry that has been operating over a long period of time or a respectable news site/blogger will often have a high Domain Authority. Links coming from high Domain Authority sites basically tell Google: “Hey, we think this website’s content is as good and reputable as ours. We trust them”. Just like in real life, if you constantly hang around with influential people, or with capable classmates, others will start to associate you to that specific identity. Getting their direct voucher (in this case, in the form of a dofollow backlink) is a big deal. This is why many link building strategies often focus on authority links and high-quality content creation! There’s also the matter of PageRank or Page Authority. Although this information is no longer public, other tools like MozBar and AHREF still lists it (as URLRating). This is another very important metric because if a popular piece of content is willing to direct its viewers to your website, it can only mean your content is also relevant and useful! Another big indicator of a good backlink is how relevant it is to your website or content. Keep in mind, this interview is almost SIX years old. Imagine how much they’ve refined topical relevance queues today, especially with RankBrain and its highly developed AI. When you’re filtering potential backlink opportunities, you have to understand you’re not going to get perfectly relevant, high Domain Authority links from day one (unless you’re willing to pay money or know some really important people). No, you’re most likely going to have to settle with “relevant enough” backlinks at first. For example, if you’re running an affiliate marketing website that sells fitness or bodybuilding equipment, getting an actual bodybuilder to link your reviews on dumbbells counts as a highly relevant link. On the other hand, getting a fellow supplement affiliate site to link your bodybuilding equipment homepage in an article on “getting ripped” counts as a link with decent relevance. You’re both in the fitness niche, but don’t compete with each other, so it’s okay to get them to link you. You should only discard zero relevance links in your link building strategy. Your less “related articles” can become nofollow links that fall into your anchor text diversification efforts, something we’ll tackle shortly. The “nofollow” and “dofollow” are tags that basically tells Google whether website endorse your content as trustworthy or not. Dofollow links are obviously more powerful in terms of SEO, but nofollow links also have a role in your link building for SEO strategy, mainly because you’ll want your anchor text diversification to look as natural as possible. Your nofollow links should come either from big platforms like YouTube or Reddit and from low relevance websites. Keep your best links with a dofollow tag whenever possible. When we talk about link building with SEO, it’s important you negotiate where exactly it’ll be featured. Google themselves have said that links that weren’t “…editorially placed or vouched by the site’s owner on a page…” can be considered unnatural links. But what does this mean? Link Placement for Tier 1: You get linked by a website editor/owner in a specific piece of content located in the body of a website, this could be an article, guide, resource page, etc. Link Placement for Tier 2: You get placed on a footer. These link work, but they’re also sitewide links meaning they could skew your anchor text distribution because they’re on every page on the website. Link Placement for Tier 3: Sidebar links. Their value is not only greatly diminished in terms of linking power, but they can also be risky since it’s a common practice to sell “sidebar spots”, something that Google hates (same applies to any paid/standalone link, really). Link building strategies obviously aim for tier 1 position links, but it’s not always possible to opt for these. There are ways to make sure footer links only appear on a Homepage and not on every page to look less spammy, but it’s ultimately up to you if you want to risk it. An anchor text is the clickable text section of a link. If you’re selling, say, dumbbell weights, getting a natural link to your site with the anchor text “best dumbbell weights” would be ideal, since it’ll help Google determine what your page is about. This sounds great in theory, but it’s actually not recommended, at all, that 100% of your backlinks have this specific anchor text. Having exact matching anchor texts is useful, sure, but be sure to diversify them. For example, URL backlinks (www.yourwebsite.com) are also a natural way of linking websites, and it’s recommended you have a healthy mix of anchor texts that link to you. Whenever I’m doing link building for SEO, I always check out what my competitor’s anchor text distribution looks like (especially if they’re currently #1), so that I get a good idea of what Google considers is a “good” distribution for my niche and industry. You can do this with AHREF, SEMRush or Moz’s Link Explorer. Depending on what your goals are when you’re doing some link building for your website, direct traffic might be an important metric to consider. Sometimes you’ll do link building for SEO purposes exclusively, meaning that you care more about the metrics behind the link rather than the actual referral traffic, but the very best links will also bring you customers willing to pay for your products. We at blackhatlinks recommend you check out our Best SEO Tools article to figure out which tool can give you accurate traffic data. I personally like AHREF and SEMRush, but there are cheaper options featured in our article. Guest posting is FAR from dead, but the game has certainly changed. For example, a common practice known as “cross-posting” or “link exchange” that involved two parties linking each other, in their respective websites, as a form of “link trading” is not nearly as powerful as it once was. Google themselves detects these linking patterns and devalues their SEO power, regardless of how good the content is. See how this can be a problem? This is why you exploit guest posting with more of a white hat approach: you use these guest posts to show search engines you’re an expert in your industry by establishing authority, increasing your social media following, direct traffic, your brand visibility and obtain network opportunities. Never underestimate the power of networking, you might know people who might be glad to link your content for free or even offer link exchanges in the future. That way you avoid cross-linking by linking other websites they own that might be related to your business or niche. Win/Win scenario. Link building strategies also consider “secondary” benefits from an SEO standpoint and capitalize BIG on opportunities. Resource pages are another important part of any link building strategies. They help you position your brand as an authority and they can pack some serious linking power (since these sorts of pages tend to have decent PageRank, and maybe even solid Domain Authority metrics). The goal here is to go for some high to medium relevance resource pages so that the link is both useful to the website’s audience, and of course your SEO campaign. Once you get yourself a list, filter it and start contacting the site’s owners, and ask nicely to be added. Getting local citations is another crafty way to get some extra backlinks, and maybe even get some local traffic going to your website. Running an affiliate site? It doesn’t matter, you can still present yourself as a local business in Google’s eyes. I recommend you follow our ultimate Local SEO Guide, specifically our Local Citations section on how to get the most out of them. To keep it short, follow the steps we’ve outlined in that article, and then register your business in Yellow Pages, Yahoo Local, Yelp, Trip Advisor, you name it. Keep in mind this link building for SEO resource probably won’t net you huge SEO gains, but they’re excellent for initial link building, local traffic funneling and it makes your website look legit in Google’s eyes. The Skyscraper technique (a term coined by Brian Dean) is another effective link building for SEO tactic. You basically find the top trending content in your niche or industry and make it better. Then, you contact the websites that shared this content and ask them to replace the original link with yours. Buzzsumo is particularly good for finding popular pieces of content in your niche. You can expand a particular section of an article you felt could’ve been better with your own knowledge, or maybe even turn it into an infographic piece that you can share across different social media platform (which is likely to trend, seeing as it’s a popular topic in your industry). On the plus side, it can get you very powerful backlinks in terms of metrics and traffic, so keep that in mind! Private Blog Networks are, quite simply said, amazing. Private Blog Networks are, like its name says, a series of websites owned by a company or team of SEO experts that provide you with high-quality links that you can control. You can specify if you need dofollow or nofollow links (and specific anchor text) for optimal diversification and high topical relevance (since these networks operate on any large industry or niche you can think of). The only caveat is, that you must employ professional PBN owners that make a living out of it, and not some random freelancer that offers you “backlink packs” from websites he openly advertises. Google has stated in the past that it does everything they can to stop PBNs. And yet they’re still an integral part of any link building for SEO strategy. Because, when done right, they are almost impossible to distinguish from the millions of people that run blogs and websites and decide to link to another people’s content. It’s as simple as that. Adapt to the blogger’s ideas if you have to. Some bloggers are happy to bounce ideas back and forth, others believe they know their audience’s interests better than anyone, and in turn, want specific content developed for them in exchange for a link. Both are valid approaches. Be honest and genuine in your conversations! Personalize your email. Don’t just use a template with “Hey, Admin” as the subject. It’s okay (even recommended) that you’re brief in your initial email, but take the time to learn a bit about the blog and comment on that as part of your presentation. IFTT basically allows you to notify your audience automatically every time you post new content on your website. It’s very easy to configure, and it allows you to get social media interactions that are amazing for building brand awareness, traffic and even masking PBNs effectively. Positive social media signals are important, regardless if you’re going full Whitehat, Blackhat or Greyhat for your SEO campaign. If you’re looking for a very effective, fast boost for your social media presence, I suggest you take a look at our complete ranking guide. It’s a tried and true method that has worked on a great number of niches and industries. People like to follow accounts that already have some followers built into it, rather than some new account that was registered a day ago. That’s it, everyone! These are some of our favorite link building techniques for SEO. Following this guide will allow you to get a large variety of backlinks that’ll mask your PBN links, get you traffic and at the same time position your brand in your niche fairly quickly. A big part of successful link building comes from effective networking and negotiations, skills you’ll develop over time, so don’t be discouraged if your initial attempts land you a very small number of backlinks, the key here is to never give up, and to continuously perfect your method over time. And Remember: SEO campaigns are not a sprint, they’re marathons. As always, if you have any questions or doubts, feel free to drop a comment! Thank you very much. Impressive and quite an indepth research on Link building.